One of my favorite video game mechanics is harnessing the relationship between light and shadow for clever platforming puzzles. That’s why I’m excited about Iris Fall, a gorgeous new game from Chinese developer Next Studios. The visuals first drew me to Iris Fall. Heavy, dark and near-monochrome, the game’s art direction is exactly my sort of jam. It was love at first trailer. While the trailer for Iris Fall communicates the visual style of the game exquisitely, it doesn’t do a great job of conveying how exactly the game works. Young Iris wakes up from a dream to find herself trapped in a strange world of light and shadow. It’s like a giant puzzle box made up of different rooms, each a puzzle involving playing with light and the absence thereof. Take this massive robot room from early on in the game. Fiddling with the rotating floor, Iris discovers a gear that, when handed to the robotic giant, enables him to be moved via a pair of levers. Moving the robot with the levers connects the shadow of a set of gears on the wall, enabling them to be spun. Spinning those gears moves the shadow clock hands. Finally, thanks to the magic of Iris’ gothic wonderland, our hero can shift into the shadow realm, where the clock hands form a path. 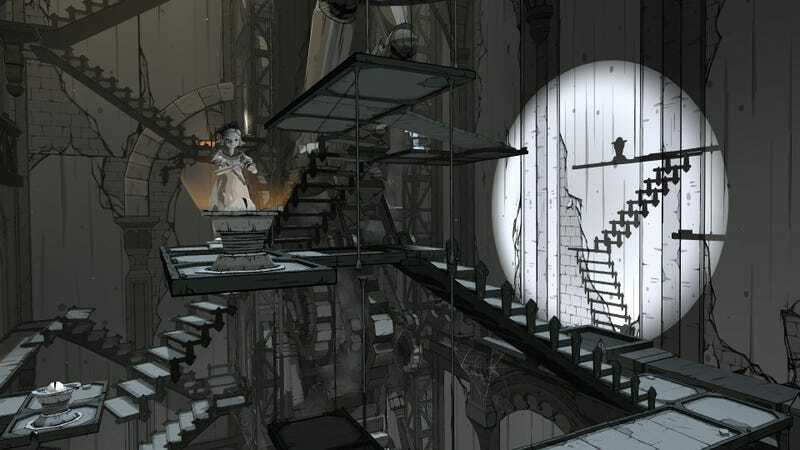 There’s a lot of play between mechanical contraptions in Iris Fall, such as rotating staircases to shift shadows around. There are more traditional puzzles as well, involving matching images and such, but the game shines the brightest when at its darkest. Iris Fall is now available on Steam, where it’s currently on sale. If you like clever and atmospheric puzzle games, this is an excellent one of those, and it’s gorgeous to boot.